The UK's largest selection of brand new arcade machines. All the top brands and latest games. Lowest prices guaranteed, free delivery and installation, backed by award winning service. Here at Home Leisure Direct we offer a great range of new arcade machines for home and commercial environments. We have a huge selection of arcade machines such as classic arcade games, shooting and racing games, pinball, and boxing and basketball machines amongst many others, for you to view online or visit in our showroom. We've seen a huge rise in demand for all types of arcade machines in recent years as consumers have realised that they can play all of their favourite arcade games without leaving their own home. Get your adrenaline pumping with these arcade games, playing all of your favourites without even having to leave your house. They are great fun for one or two players and a whole host of onlookers, ensuring these arcade machines will be the centre of attention in your games or leisure room. Any one of these machines will be a great centerpiece to any games or leisure room and always prove to be the center of attention among visitors, friends and families. Our range of arcade machines will supply endless entertainment to any home or suitable commercial environment. The multiplay arcade units are loaded with classic arcade games that are great fun for single or two players and even a gang of onlookers of all ages. If you have a large household or are a classic arcade fanatic, these arcade machines will be perfect as they are great fun for all ages and will provide you with endless entertainment. Depending on what model you select, they include such famous games as Centipede, Donkey Kong, Donkey Kong Jr., Frogger, Galaga, Pacman, Ms. Pacman, and Space Invaders, to name but a few. We sell many of the world's newest and greatest arcade machines, including fantastic licensed machines such as Halo and Tomb Raider, as well as favourites such as Daytona and Big Buck HD, plus many more. Our basketball machines are great fun and irresistible to any visitor to test their skills against. Test your skill at shooting hoops with all the fun of an arcade, without leaving your own home and playing as many times as you like! Our range is constantly growing, however we work with so many manufacturers that we can't always list their products quickly enough! So if you're searching for anything in particular, drop us an e-mail or give us a call and we'll see if we can find it for you. We deal with all the world's leading arcade machine manufacturers including SEGA, Konami, Neo Geo, Capcom and Namco. 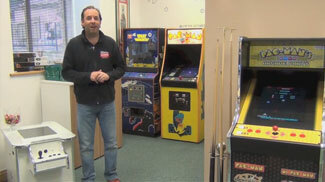 We have a network of the finest dealers of arcade machines UK wide and can source 99% of titles requested. So whether you are after new arcade machines, cheap arcade machines for sale or second hand arcade machines, please call our sales team on the freephone number for more information on our product finder service. For further advice on our arcade range, please call us free on 0800 622 6464 and speak to a member of our expert team who will be able to answer any questions you might have.